I love this cookbook!!! 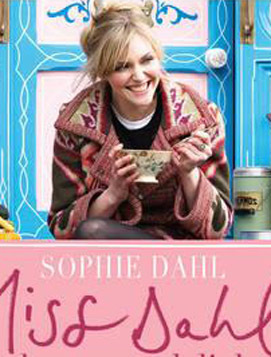 Sophie Dahl is a vegetarian who puts actual meat recipes in her cookbook! This is really perfect for those of us who are trying to make a conscious effort to eat less meat. There is a recipe for Sunday Roast Chicken that is really delicious. Sophie tells us that even though she is a vegetarian Sunday would not be Sunday without a roast chicken so she makes it for others. The best parts of this book are the breakfast recipes. Baked eggs with Swiss chard, tawny granola, grilled figs with ricotta and thyme honey. Other delightful recipes include grilled and roasted vegetables with fish, a warm winter vegetable salad, and easily made fresh soups. I should mention that yet one more thing I love about this book is that it is easy to follow and is divided into seasons and within seasons it is sectioned into breakfast and lunch and dinner…perfection!!! I must add that the stories that sort of mingle throughout the book are also delightful. I believe that she is the grandaughter of Roald Dahl…the author of Fantastic Mr. Fox and many more books. Beautiful photos only add to the pleasure within this very special cookbook. I love the idea that the recipes are divided by seasons. This looks like a fun cookbook!